Posted on May 29, 2015 by wp-admin Posted in Car Diagnostic Tool	. 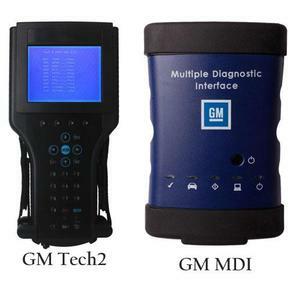 Since 2006, rumor has it that GM Tech2 GM Scanner will be replaced by GM MDI (Multiple Diagnostic Interface), a new piece of equipment coming out to work alongside the Tech 2, but today we still can find Tech 2 in GM forums, where drivers are hesitate between MDI and Tech2. Here I will analyze the difference between the two tools and reveal the reason why Tech2 is not be replaced. MDI is a diagnostic and programming device. Apart from diagnosing 1990 to 2013 GM, Opel, Chevrolet and Saab, it also supports TIS2Web, GM Global Diagnostics System (GDS), SPS and MDI Manager Software, European Chevrolet offline programming, SPS programming on existing and future SGM vehicles, and will be able to do remote programming with the Tech 2 for all 2007 and previous vehicles in the near future. Using the GM MDI for programming can free up your Tech 2 for diagnostics and other tasks.GM Tech 2 mainly supports diagnosing; with TIS 2000 CD in the package, it can also do programming. But it cannot program as many systems as GDI. GM MDI Scanner works with a PC. It takes advantage of all those new PCs installed in the service bays under the Multiple PC Initiative and is able to communicate with a laptop via both USB and WiFi so that users can put MDI in a vehicle in the parking lot and communicate with it my PC.Tech2 is a hand held device and communicates vehicles via USB cable, no additional PC is needed. It is very easy to carry and use. The GM MDI offers faster programming speed at a lower cost. Depending on vehicle architecture (protocols/modules), the GM MDI can be 20-70% faster than the Tech 2. This helps alleviate vehicle battery drain problems during programming. Tags: GM MDI, GM MDI Scan tool, GM MDI Scanner, GM scanner, gm tech 2, GM Tech2, gm tech2 candi, GM Tech2 Scan Tool, gm tech2 scanner	. Posted on May 27, 2015 by wp-admin Posted in Launch X431	. Even when you take good care of your car, repairs will be needed for wear and tear items like axle boots and brake rotors. One of the more expensive repairs on a higher-mileage car is the timing belt. This is usually required between 75K-120K depending on make of vehicle. We recommend doing the water pump and other drive belts with your timing belt because of the wear on those parts as well. Failing to replace the timing belt can result in serious heartache when the belt eventually breaks. We spend a little more time with your vehicle (like a doctor does with his patient) so that we can formulate a full and accurate health report for you. The last thing we want is for you to complete your oil change today and then have that timing belt break tomorrow. We spend a little more time to ensure you’re safety on the roads. The x431 pad launch runs on Windows 7, and offers a true PC-Based Diagnostic Scan Tool experience that is both wireless to the car and the internet. Multiple applications can be run simultaneously and at blazing fast speeds. Perform diagnostics, view graphs, and record PID data all while on the web gathering diagnostic information from your favorite repair database. Bi-directional controls, module coding, and the latest in OE level coverage and capabilities – for Asian, European and Domestic carlines – are right at your fingertips with the Launch Pad. Q1: Can I use KTAG K-TAG OBD ECU Programming Tool on Windows XP? Q2: Ktag “Communication error: please check power and connections-ox1008″. KTAG communication errorA2: Please check whether the car ECU is connected with the power. Q3: Does K-TAG ECU Programming Tool have limit numuber of times, only 32 and then throw it away? A3: No, it has no limit you can always use it. But if you keep on giving ECU to write map file, then it has about 500 times limit. If your KTAG has limit counter and the KTAG board is no gluing, please contact us, we will send you chip for replacement, but there are two conditions to change chip. 1. It is our KTAG not from other sellers. 2. You are require to know change the chip otherwise the KTAG will be damaged. Q4: How to do if your KTAG K-TAG OBD ECU Programming Tool damaged after online update? C. If you cannot change the CPU and chip by youself, you can ship back the main unit back to us, we will repair for you. Tags: K-TAG, K-TAG ECU Programming Tool, KTAG, KTAG ECU programmer，X-431 PAD, KTAG K-TAG ECU Programming Tool, Launch PAD, launch x-431 pad, launch x431 pad, PAD X-431, PAD X431, X431 PAD	. Posted on May 26, 2015 by wp-admin Posted in Car Diagnostic Tool	. X-431 PAD Launch Tech is based on new high-end automotive fault diagnostic device Android system, the heritage of the company to the automotive fault diagnosis technology models covering a broad, powerful, special features and more accurate test data and many other advantages, through the car diagnostic connector Bluetooth communication and mobile intelligent terminals, to achieve full product models, car fault diagnosis system-wide. While supporting the expansion module application scope, sensors, endoscopy, multimeter, battery detection. Launch Tech has adopted the performance and usability of tablet computing with this new piece of kit, making it one of the most user-friendly and accessible they have produced. Of course, being a Launch X431, it is the result of more than twenty years’ experience in vehicle diagnostics and displays all of the high performance functionality which has made their previous X431 tools so popular. Launch UK has released a new Android-based diagnostic tool. The touch-screen X431 Euro Pad II uses the same vehicle diagnostic software as previous Launch X431 scan tools, but also features improved multi-manufacturer vehicle coverage, powerful special functions, accurate and ultra-fast live data and graphing, along with module coding capacities.Launch UK managing director, Dave Richards, believes the automotive aftermarket has come a long way in embracing diagnostics, but that workshops require more support in order to offer a complete solution as one piece of kit is no longer enough to offer the best possible service and coverage. Version 2.06 K-TAG introduces another brand new novelty — J-Tag communication for Asian cars. Unlike many ECU programming tools, with K-TAG you have at your disposal only the applications really need. Once you have the hardware, you can choose which group of protocols to enable and then start working. According to the manual, I connected K-TAG to the diagnostic OBD 16 pin port to install the software. The software displayed “Read the ECU” after installation. Then I closed the software when it successfully read the message. Finally, I was allowed to disconnect the K-TAG from the pin port. Tags: K-TAG, Launch X431, X-431 PAD	. Posted on May 17, 2015 by wp-admin Posted in Car Repair software	. 2014 ALLDATA 10.53, the leading computer-based diagnostic, repair and estimating information system, can help you boost shop performance and build customer loyalty as you efficiently repair more makes and reduce comebacks. Demo a real version of the program you’ll be using.Companies that offer demos of their actual working programs understand that you need to know exactly what you are buying. Live online demos are also very useful for giving a comprehensive overview to determine if automotive repair software, auto parts software or tire shop software meets your requirements, or whether you need an automotive business management system that effectively handles all. Be sure the company is open to showing you any aspect of the program you need to see ALL Auto Repair Software. Does the company sufficiently keep up with technology?You don’t want to get left behind, or stuck with an antiquated product that can’t be expanded, updated, or integrated with other products in the marketplace. While you don’t want to invest in new computers more often than is necessary for competing in today’s market, you do want a company that uses modern database technology and development tools. Tags: ALL Auto Repair Software, ALLDATA 10.53, alldata mitchell, Auto Repair Software, Car Repair Software	. Posted on May 16, 2015 by wp-admin Posted in Car Repair software	. With alldata mitchell Repair, you have instant access to a single source of accurate, up-to-date OE-direct diagnosis, repair, and maintenance information. Available online 24/7 and automatically updated, our huge database offers you information covering more than 33,000 engine-specific vehicles. Repair procedures, diagrams and TSBs are specific to each vehicle for fast, factory-correct repairs. Your customers will appreciate knowing that your repairs meet manufacturer standards. Mitchell AUTO repair database, the accuracy of consistent with the original maintenance manual (some more accurate than the original manual, because in the editing process corrected the original maintenance manual on the many errors), and to maintain the unique style and the Mitchell Database Query System Auto Repair Software. Autodata offers the only source of information OEMs, covering many models, with quality and quantity of data in constant evolution.An experience of over 40 years in publishing documentation for automotive professionals Autodata allowed to develop a unique style.Autodata products, written in a concise, clear and consistent for all subjects taken and manufacturers, are now known to most European mechanics and technicians. Posted on May 15, 2015 by wp-admin Posted in Car Diagnostic Tool	. Last week, I received the alldata 10.53 hard drive, i want to ensure before i install, can i install it on my Windows 8 computer? What should i notice when install it? OK, better use xp 32 bit, and close close all antivirus programs before installation and use. The ALLDATA 10.53 hard drive work ok now, Spring is the perfect time to say thank you to your vehicle for making through the winter. The cold temperatures, snow, ice, salt and potholes all take quite a toll on your car. Be sure to schedule a spring checkup to make sure nothing is out of place. You want to make sure the following components get attention. Tire Pressure: Cold weather can change your tire pressure. Be sure that all tires, including your spare, are properly inflated and balanced. Windshield Wipers: They have been abused during the winter, check to see that there aren’t any cracks or visible wear. Batteries and Spark Plugs: They have been working over time during the cold winter. Test and replace old or weak batteries, spark plugs and spark plug wires. Brakes: Not only should you inspect your brake pads, but be sure to include the lines, hoses and brake fluid for proper level. Your safety depends on your brakes! Wheel Alignment and Suspension: Colorado potholes seem to get bigger and bigger each year and they can be downright nasty to your shocks and struts. Inspecting them now can help prevent any other issues down the road. Schedule an alignment and get back on the road safely ALL Auto Repair Software. Leading edge software like AutoServe1 is becoming increasingly popular in repair shops as technology continues to evolve and improve the way we handle car maintenance. Repair shops can sometimes struggle to create and maintain trust with their customers but AutoServe1 has found a way to bring those worries and concerns to rest with a streamlined system that can benefit everyone in the shop ecosystem. Posted on May 14, 2015 by wp-admin Posted in Car Repair software	. Autonumen Alldata repair 10.53 have fast access to the industry’s best information for vehicles from 1982 to present including TSBs, maintenance schedules, manufacturer recall information, OE solutions, and factory images and diagrams. This article is compiled by Autonumen.com, if you have any advice on it, pls feel free to contact Autonumen – China OBD2 DiagnosticTool Automotive Diagnostic Tools Car Key Programmer OBD2 ECU chip tuning tool Center. ALLDATA 10.53 , the leading information system of automotive electronic data analysis and maintenance,and computer-based diagnose, repair and estimate.In America,AllData is been called the Top CD of mechanics data.According to the evaluation from American and Chinese professionals in the field of vehicle repairing,the data of AllData is more complete and newer,also it is the most convenient one to use.The price of AllData is much higher,but the quantity of data is larger,the updata speed is faster,the service is more excellent,it is the first choice of those large-scale garages who owns a certain level and specializes in high-grade imported vehicles. Posted on May 8, 2015 by wp-admin Posted in Car Diagnostic Tool	. Summer is coming and it’s time to get that auto air service done before the really hot weather sets in. You’re not the only one to put things off. Like, getting your auto air repaired. Last fall, your a/c quit blowing cold air, but you figured it could wait because winter was just around the corner. You’re not the only one to put things off. Like, getting your auto air repaired. Last fall, your a/c quit blowing cold air, but you figured it could wait because winter was just around the corner. Who’s going to worry if the air conditioner is not blowing cold air when you’ve got the windows down to enjoy New Orleans’ wonderful winter weather? Each screen has several tabs. The Vehicle Search takes you to the initial search screen for the vehicles. The AutoIQ tab has a short video presentation about the different parts and systems of a vehicle. The topics include fuel management, heating and air conditioning, and brakes.The Care & Repair Tips section provides links for information about caring for and repairing your vehicle, as well as the necessary tools for buying parts and supplies. This section provides information beyond what your mechanic tells you and can also provide information to help you complete basic maintenance issues yourself. Finally, the Troubleshooting tab is a great place to start to diagnose problems with your Car Repair Software. Tags: ALL Auto Repair Software, Auto Repair Software, Car Repair Software	. Posted on May 7, 2015 by wp-admin Posted in Car Diagnostic Tool	. Many mechanics claim that they can repair any type of car and this is simply not the case unless they have the proper diagnostic computers, tools, and specialty equipment needed to work on high end European vehicles. At Pro Car Mechanics we have invested heavily in technology both in tools and software to make the service process more streamlined. The WreckMaster certification program is the towing industry’s first operator certification and since its introduction in 1991 over 20,000 towing and recovery operators have chosen WreckMaster for their towing certification. It has been developed and redeveloped each and every year that the program has been presented. We feel that through our research and development team we can stay in tune with our changing industry through direct contact at our training seminars and industry events Auto Repair Software. Few people know the inner workings of their cars and that is the reason they need a competent repair shop. At Pro Car Mechanics we take great pride in the quality of our work. All of our technicians are highly qualified, as well as ASE Certified, and care about providing the best service possible to all of our customers. It is no wonder then that we are the first choice for anyone looking for affordable European auto repair in Gardena. We also offer new and used car sales and modification services Autonumen.com. You can’t fix a computer with a wrench. Instead, fixing modern cars requires special diagnostic tools and official service information—information that some manufacturers don’t share with independent repair techs like Eve. Broken or frayed throttle or clutch cable can leave you on the side of the road, so check ‘em. Operate anything connected to a cable and make sure that levers and cables feel smooth and don’t bind. Apply the front brake and push the bike forward. The brake should feel firm, and the front wheel should not move. Check the rear brake in the same fashion . Posted on May 6, 2015 by wp-admin Posted in Car Diagnostic Tool	. The National Automotive Technicians Education Foundation, which sets the industry standards for auto-repair curricula used by schools and training programs, has made changes to reflect the changing needs of service departments. Contestants qualify by taking a written exam, then move on to a hands-on competition at the state level, which involves diagnosing and repairing a bugged-for-fault Ford vehicle as quickly as possible. Winning teams advance to the national finals in June in Dearborn, Mich., Ford’s hometown, where they take a written test and do another hands-on challenge. The winner receives a scholarship to pursue Ford’s Automotive Student Service Educational Training, a two-year associate’s degree program at a sponsoring dealership.Jeff Barber, a Ford field service engineer, says Ford education programs like ASSET and FACT allow students to “continue their automotive education beyond high school and improve their skills for the ever-changing automotive field. After working over 15 years in the auto repair industry, I have some insightI would like to share with everyone. The auto repair industry has changed quite a bit over the years as more complex automobiles have driven a new kind of mechanic into existence. Some of this has fostered smarter, better trained mechanics. However, it has developed the parts swapping business into enormous proportions. Part of thereason I changed careers was because I was so frustrated by working in such a crooked environment. Bad mechanics that lacked morals made the most money and honest ones lagged behind significantly. Most mechanics are paid 100% commission based on what they flag. This is not always true but it is the overwhelming majority that are paid this way. For these mechanics, the motivation is to flag as many hours per day as possible. It is not impossible, or even that uncommon, for a mechanic to flag over 16 hours in an 8 hour day. The mechanic will make a given wage per flat rate hour. If he flags no time in a given day, he makes no money at all. Few shops guarantee a minimum income. There is no real maximum either. It is not unheard of for a fast, crooked mechanic to flag well over 80 hours in 5 day a week while working only a little over 8 hours per day. Thats not to say all mechanics that flag big hours are crooks though. The work load can be seasonal too. It was quite common to have a 50% or more pay fluctuation (flagged hours) Auto Repair Software from winter to summer. Tags: ALL Auto Repair Software, Car Repair Software，Auto Repair Software	.